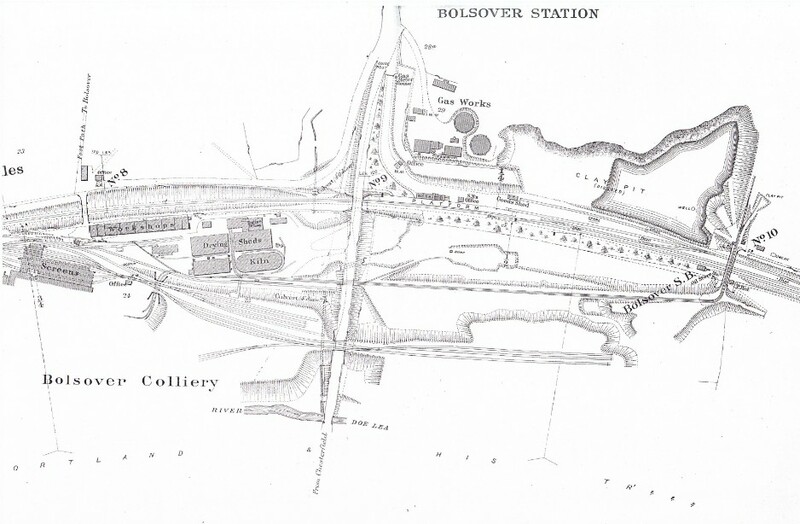 Bolsover Station Plan, showing Gas Works, Brick Yard & the Colliery. Midland Railway. Thanks to Glynn Waite, John Platts & Mike King. Photographs copyright. Bolsover Station Masters by Glynn Waite. Doe Lea Line by Glynn Waite. William James Whittock was born at Midsomer Norton, Somerset, on 10th August 1877. Many people seeking employment on the railways in rural areas found that there were no vacancies locally, but would be taken on if they were prepared to move to locations in industrial areas. Consequently, William started on the Midland Railway as a Number Taker at Staveley on 5th September 1898 at the age of 21. For those who like to know somewhat irrelevant information, he was 5ft 8 and a half inches! He became an Under Shunter at Staveley in December 1899 and was still shown in that grade in October 1901. 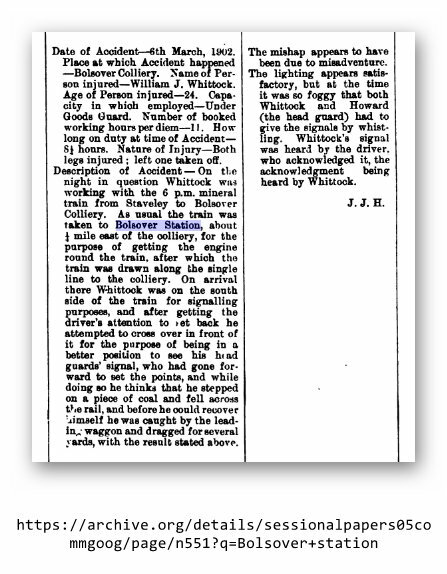 There is nothing in official Midland Railway staff records that show him becoming an Under Guard, but the work undertaken by the two grades was similar and interchangeable, while the Company was often slow in recording alterations in posts. The entry in the HQ accident book was brief and had his surname wrong (see attachment). The Midland Railway was not a bad employer when accidents occurred. It is quite likely that William was provided with an artificial limb. The Company also sought to find its employees alternative work. Records show that William became a signalman in Summit Sidings signal box at Staveley in December 1903 (following a period of training) and that he moved to a similar post in Masborough Sorting Sidings Ground Frame, Rotherham, in May 1905. He was still a signalman, living in Sheffield Road, Ickles, Rotherham in the 1911 census.